When you need more than simple drop-down and fly out menus, you need a Maxi menu! Maxi Menu Magic allows you to combine traditional drop-down fly out menus with content-rich mega menus in a responsive, adapting, and totally gorgeous way. Vertical Maxi Menus display as a multi-level accordion, a perfect configuration to be placed in a sidebar, for instance. Maxi Menu Magic actually comes with two primary UIs. The main UI is where you create and configure your menu, choosing various options, settings, and styling options. 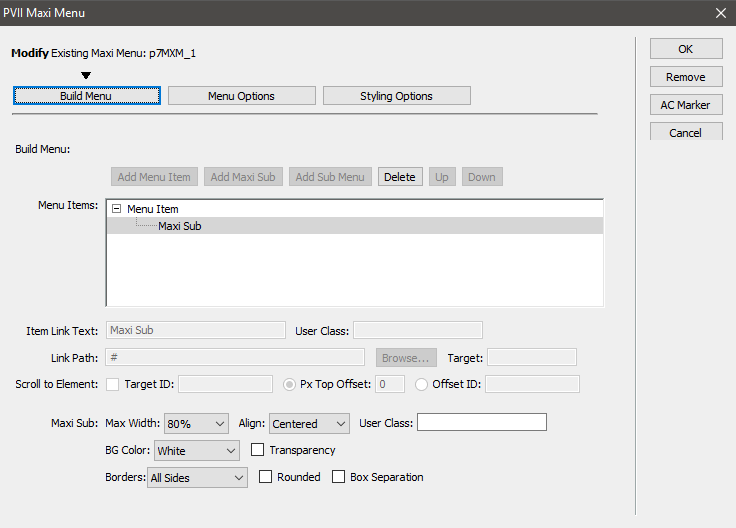 The Maxi Sub Layout Manager is where you manage the row/column configuration of your Maxi Sub Menus. When you create a Maxi Menu, the system will automatically create the asset files and folders necessary to power your menu, and link them to your page. The main asset folder is called p7mxm. When publishing your site, make sure to upload the entire p7mxm folder. It is importnt that you do not edit or alter the core or colors CSS files. Any exception or custom rules you add should be added to the p7MXM-01 CSS file only. This is important. In the event an update or new feature is added, the update could require you to replace the core or colors CSS files. There are 3 ways to access MXM. Choose the one most suitable to your workflow. When you open the interface, the system will detect the appropriate mode (Insert or Modify) based on where your cursor is. When you are Creating a new menu instance, place your cursor on your page where you want to build it. If Modifying an existing instance, place your cursor anywhere inside the existing menu and use one of the 3 methods below to open the UI. The system will always open in the correct mode. Switch to the PVII category. MXM is the next to last icon in the screen capture below. If your cursor is not inside another MXM instance, the main UI will open in Create Mode. If your cursor is inside an existing menu, the UI will open in Modify mode. MXM will convert any list-based (UL) menu, including Adaptive Menu Magic, Pop Menu Magic (all versions), Drop Menu Magic, Layout Builder NAV, Bootstrap, jQuery, as well as simple unordered lists. Simply place your cursor inside your existing menu and open the interface. 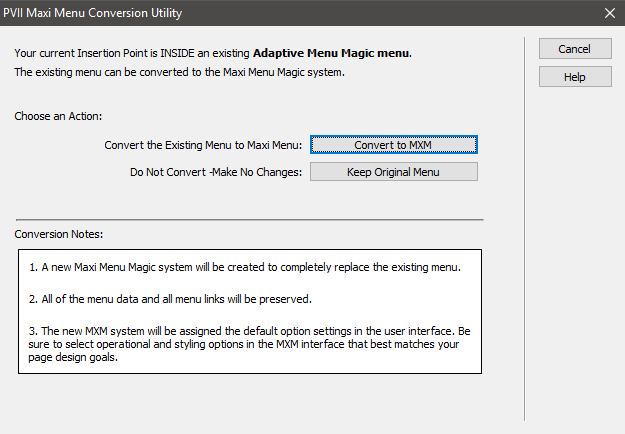 To convert your existing menu, click the Convert to MXM button. The main interface will come into focus. The converted menu's options will be set to MXM defaults. Change the options to suit and click OK to finalize the conversion. Now run the converter. Unfortunately, there is no way to save the sub-menus. You will be better off recreating them. Note: When creating a new menu make sure your insertion point is outside of any existing menu instance. You can create more than one menu on a page. The MXM interface is divided into 3 tabs, making customizing your menu easy! On this tab, you create your root menu items, traditional drop-down and fly out sub menus, and Maxi sub menus. The command buttons above the Menu Items list allow you to Add Menu Items, Add a Maxi Sub, Add (conventional) Sub Menu, Delete menu items, or move menu items Up and Down. You can add an unlimited number of Sub Menus for each root item, but root items can only have a single Maxi Sub. The edit boxes below the Menu Items list allow you to set Item Link Text, a User Class, the Link Path (URL), a Target, and Scroll to Element behaviors for smooth scrolling to ID'd elements on your page. 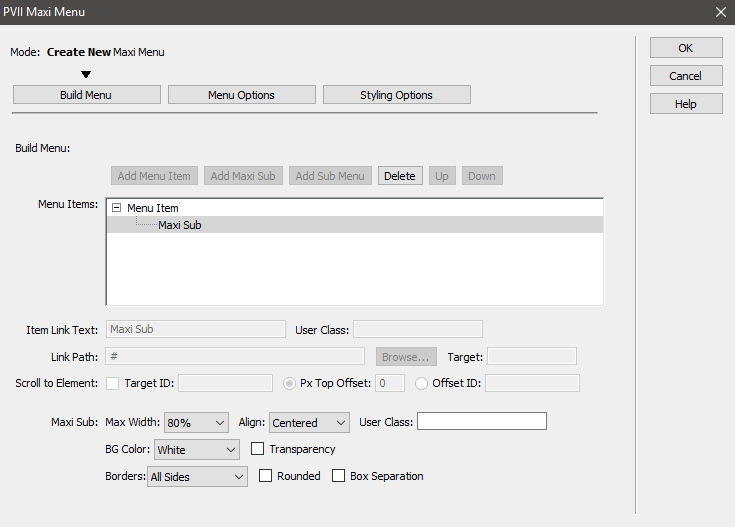 This area is also where you set style attributes for your Maxi Sub Menus. With a Maxi Sub Menu selected in the Menu Items list, choose a Max Width, Alignment, User Class, BG (background) Color, Transparency, Borders, Rounded corners, and Box Separation. Note: Setting Box Separation here will allow you to configure colored, boxy columns in the PVII Maxi Sub Layout Manager UI. Control stacking order with Z-Index. Use Edge Detection, which will reposition a sub-menu if its natural position would otherwise cause it to extend past the edge of your browser. Set the Aria Label, which alerts assistive reader users that a navigation menu follows. Align the First Sub Level Left, Center, or Right, relative to its root trigger link. This applies to conventional drop-downs only. Also set Top Offset and Left Offset for the first sub level. Set Sub Offset Top and Sub Offset Left for 2nd level and deeper sub-menus. Enable (or disable) Responsive Conversion, which tells the browser to add a hamburger-driven toolbar to hide and show the menu for phones and narrow screens. This will also cause the menu to convert to an accordion-style configuration. In phone mode, you can Start With Closed Toolbar (meaning the menu will be hidden) and choose to Show Toggle Text (text that appears next to the hamburger icon). 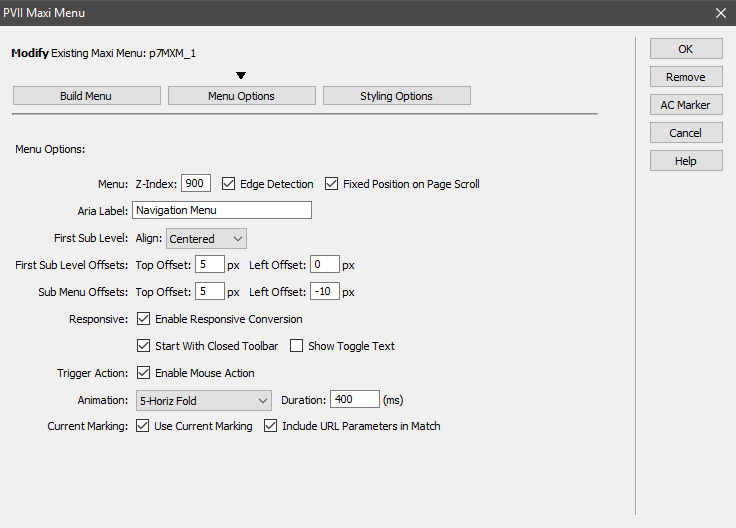 Enable Mouse Action sets up your menu to operate on mouse over in systems that use a mouse. Fixed Position on Page Scroll, locks your menu in place at the top of the browser window, so that it's always viewable. Choose from several smooth Animation methods and set the Duration (lower value = faster animation). Enable or disable Current Marking, which sets the link in your menu that matches the current page address to bold. Optionally Include URL Parameters in the Match. Menu Type: Choose Horizontal or Vertical menu orientation. Alignment: Set alignment of the root menu items Left, Center, Right, or Distribute Evenly (root menu items will be evenly distributed to fill the entire width of the menu's containing element). Set a Border around the root menu. Set a 5px Matte (white-space) around the root menu. Assign a User Class. Set BG Color. Set BG Hover color. Set Transparency. Assign various Border configurations. Set Separation between links. Set Rounded corners. Set BG Color. Set BG Hover color. Set Transparency. Assign various Border configurations for the links. Set Separation between links. Set Rounded corners. Set Sub Menu Borders (around the entire sub-menu). The main interface allows you to create Maxi Sub Menus for any of your root links. By default, we place a simple 1-column structure inside. Maxi Sub Menus are visible and fully editable inside Dreamweaver design view at all times. 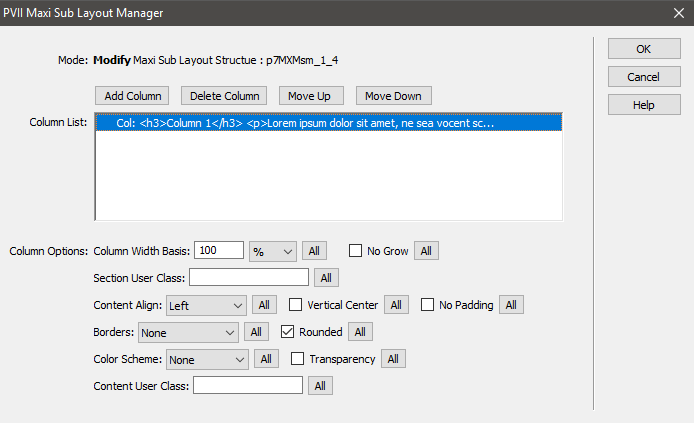 You can use the Maxi Sub Layout Manager to customize the row and column configuration inside each of your Maxi Sub Menus. 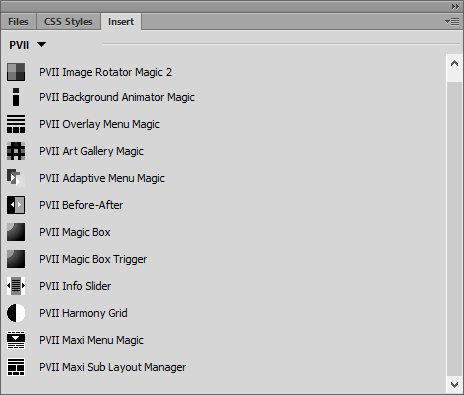 To open the Manager, right-click inside the Maxi Sub Menu and choose PVII Maxi Layout Manager. Mac Note: To learn how to emulate a right-click on a Mac that has only a single-button mouse, here is what Apple recommends. Add as many columns as you need. Use the command buttons atop the list to Add, Delete, and move your columns Up or Down. The Layout Manager is Flexbox-based, meaning that you can add as many "columns" as you want. Browsers will assume the task of doing the math, creating a row for each set of columns that equals 100% in the aggregate. for example, a single column set to a Column Width Basis of 100% will be rendered as a row. 3 columns set to 30%, 40%, and 30% will also make a row. 6 columns set to 50%, 50%, 25%, 25%, 25%, and 25% will make 2 rows. It's pretty much foolproof. You can add as many columns as you want, to make as many rows as you want. Note: For those not fluent in CSS Flexbox, it is advised that you stick with percentage widths. Each of the options in the UI include an All button. Clicking it will assign the same option value to each column currently in your Column List. Flexbox can be seriously flexible. By default, your columns will be set to Grow. That means your browser is instructed to fill the width of your Maxi Sub Menu. For instance, if you have a 3-column row that breaks to 2 columns at a certain browser/device width, the first two columns will become 50% wide, while the third column will become 100% wide. This is preferred, but you can bypass this behavior by setting the No Grow option for one or more columns. Additionally, you can set a Section User Class (no periods, please!) or multiple classes (simply separate each one with a single space). CSS coders love this option. Set Content Alignment (left, center, or right). Column content can also be set to Vertical Center, and any of your columns can be set to have No Padding. 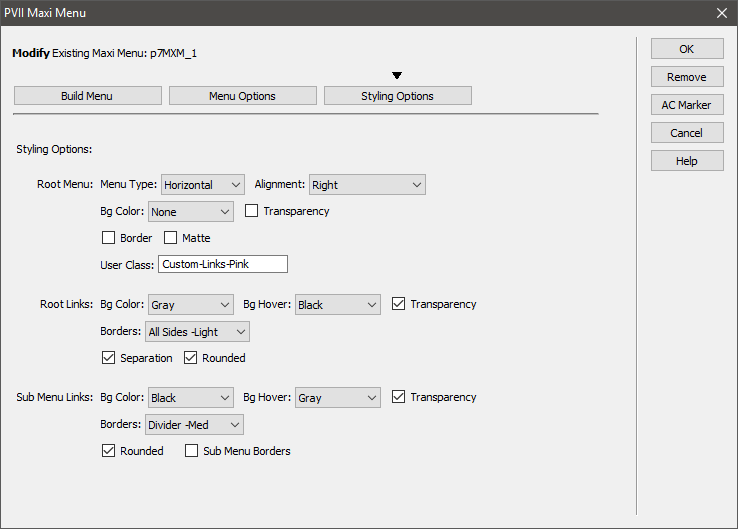 Set borders and rounded corners for each of your columns. Select a background color for each of your columns. 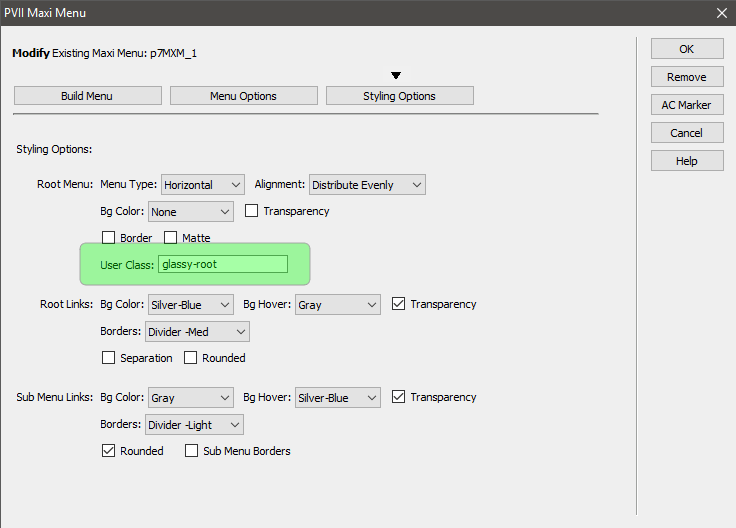 You can also make on or more columns semi-transparent by selecting the Transparency option. Note: If you chose the Box Separation option for your Maxi Sub Menu, in the main UI, you can create neat, separated boxes with distinct colors and rounded corners. Otherwise, by default, each box (column) you create will adjoin each other. Since all columns render equal height, you can assign a left, right, or left and right border to provide a divider line. Additionally, you can set a Content User Class (no periods, please!) or multiple classes (simply separate each one with a single space). This technique will work on one or more links. Simply convert the links to an unordered list and assign the maxi-text-list or maxi-text-list-boxed class. In most cases, this style will be perfectly fine for links inside a Maxi Sub Menu. Should you desire more elaborate link styles, and you are not CSS-proficient, you can use the PVII Links Toolkit. Open the MXM main UI to edit your menu settings. Switch to the Styling Options tab. In the User Class box, type in glassy-root. If you'd like to assign a glassy effect to your sub-menu links, type glassy-sub instead. If you'd like to assign the effect to both root and sub-menu links type in both class names, separated by a single space: glassy-root glassy-sub. We left you a second Easter Egg! It's in the p7MXM-01.css file and it's a series of rules, each beginning with the class selector Custom-Links-Pink. If you place that class name in the Root Menu User Class box, your menu links will become... Drumroll please! ...pink. Yes! We've written a tutorial that shows how you can create custom color themes. We suggest reading it! Close the UI without adding a menu to your page. Click this button to remove the selected menu. If this is the only menu on your page, the links to the CSS and script files will also be removed. © 2017 Project Seven Development. All Rights Reserved.